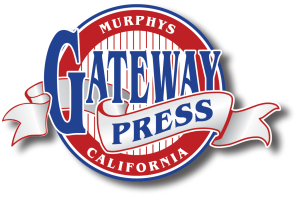 Jeanann Rogers has been with Gateway Press since September 1994. Prior to joining Gateway, she was with Hewlett Packard for 14 years as a Component Level Electronic Technician — she took early retirement to retreat to the Sierra Nevada Foothills and slow her pace of life. When she began at Gateway, she was just enetering payables: now she takes care of administration duties, customer duties, customer service, sales, estimations, orders, assisting in the Art Department, and training and assisting in all production duties as needed. So much for slowing down! To be a workaholic, you have to really enjoy what you do, and Jeanann is having the best time of her life. Be sure to stop by and say "hello" to her at Gateway Press or at the many sign conventions that she and Walt attend!